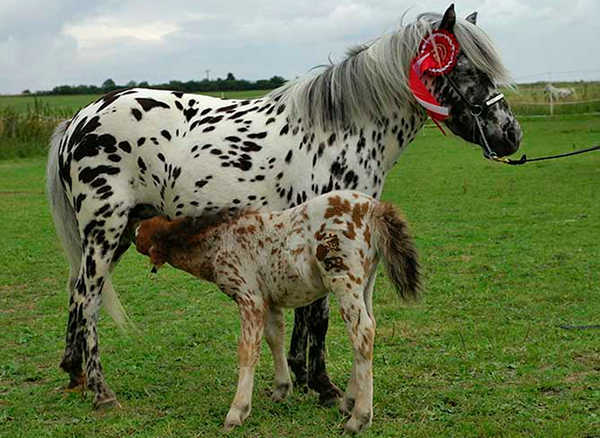 White color patterns are not linked to the color of the horse, they are a pattern applied on top of the base coat. The appaloosa patterns are expressed through the Leopard Complex and can appear on both chestnut and black base coats. The Leopard Complex creates an incredibly diverse number of patterns and types and can be found across many breeds. While they are associated with Native Americans, spotted animals have been documented in history for thousands of years. The appy white pattern can occur on any color and varies a great deal in expression, some animals can display more than one pattern. While the patterns vary widely from animal to animal, there are a few characteristics that remain constant across all animals affected by this white pattern. 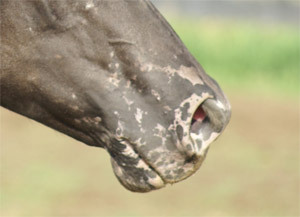 Appaloosa animals will almost always have mottling or small dots around their mucus membranes (mouth, eyes, etc). On light or pink skin the freckles are dark and on dark skin they are pink or white. 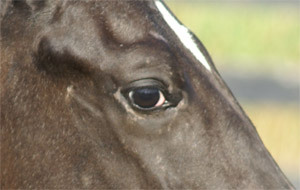 Also called walleyed, often appaloosa animals will display a white sclera of the eye. Not all appaloosas will display this trait. 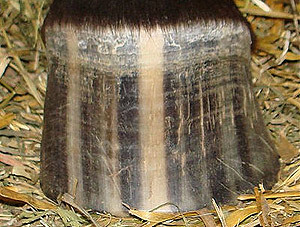 Not all hooves will display the striping and it does not matter what color the legs are, they can all be striped. Some appaloosas tails tend to grow very sparsely and the hair won’t grow very long past the end of the tail bone. 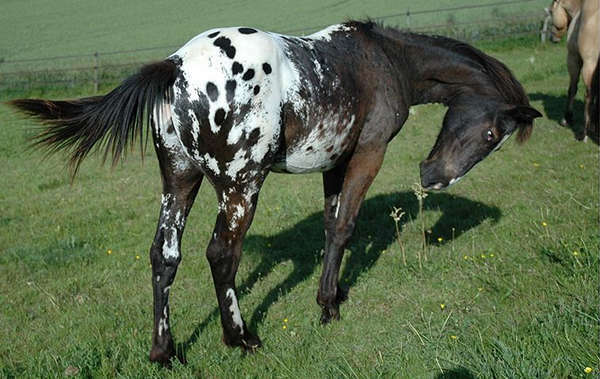 There are an immeasurable number of patterns in the appaloosa spectrum and they can be (and often are) mixed and matched. Named for the Leopard complex, these animals are pure white with dark base colored spots fairly even distributed throughout the coat – similar to dalmations. Spots can be concentrated on the head and legs. This is the maximum expression of the Leopard Complex and creates an animal that is pure white with a few colored spots in their coat, generally on the flank, elbow, neck and head. They can also display varnish marks or roaning. These animals are born with leopard white patterns, but with dark colored head and legs. As they mature and shed they eventually become a full Leopard. 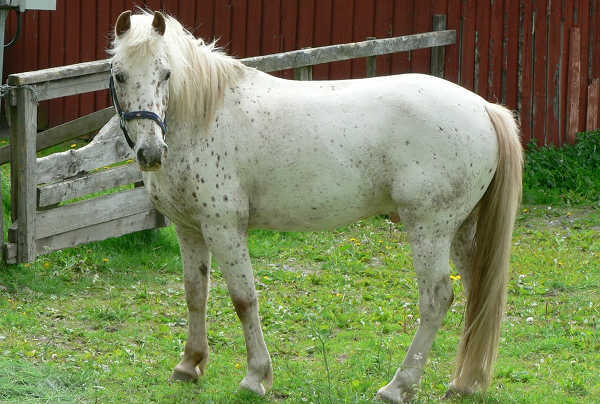 Blanket is the most common and recognizable of the appaloosa patterns. It produces animals of a dark base color with a blanket of white across the hindquarters. 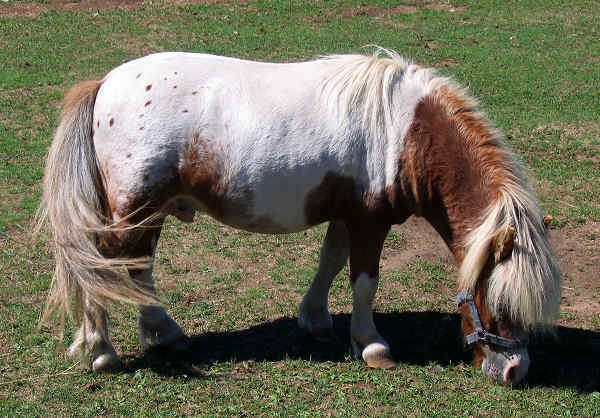 Edges can be clean or roaned and they must have spots of their base color on the field of white. 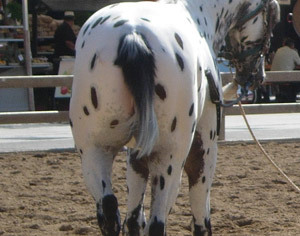 As with most appaloosa patterns, spots may move and change with each shedding. Similar to the blanket appys except the blanket field doesn’t have spots in it (the image above was the closest I could find). A snowcap blanket can extend across most of the body, but they usually retain their base color on head, legs, flanks and elbows. 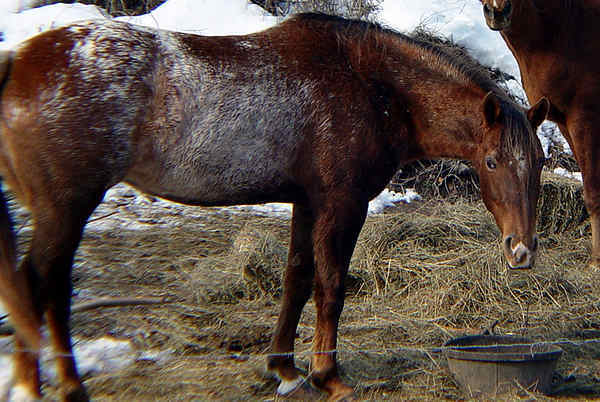 Often mistaken for roan roan, frosted animals will not display the dark points characteristic of roan animals. 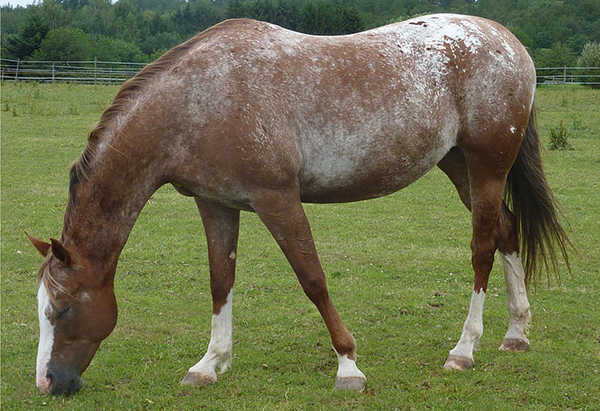 Frost appaloosas white patterning generally occurs along the topline and hips. Snowflake appys vary from tiny flecks of white to a larger pattern of white across the body. 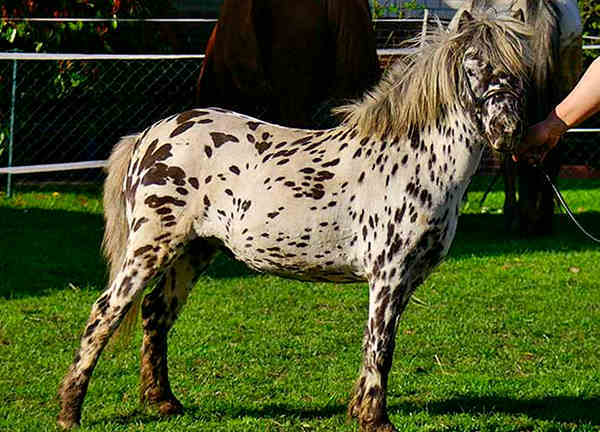 They will not display a blanket over their hindquarters but spots randomly over the body which can enlarge as the horse ages, snowflake appys often grow lighter as they age. 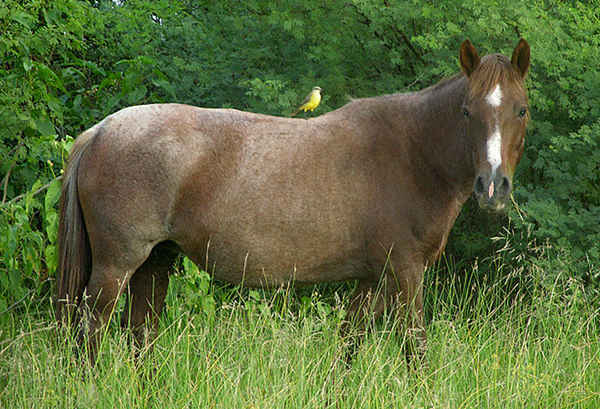 Varnish roan may look like it (and are often mistaken for them), it is not the result of the roan white pattern or a grey modifier. They are the result of the Leopard Complex and are born the base color (often with some spotting) and they begin to blur or fade as they age. Animals often retain their base color over bony parts.